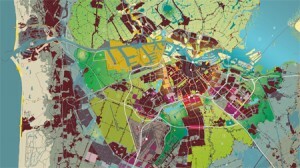 The recently published Structural Vision Amsterdam 2040 is the 10th major plan for the Dutch capital. The first – the legendary General Extension Plan – was published in May 1935, more than 75 years ago. Since then the city has, on average, produced a new integrated vision for the future for the whole of its territory every seven years. The Structural Vision Amsterdam 2040 continues this Amsterdam tradition of making coherent plans in a democratic manner, but it differs from its predecessors in one important regard: rarely has a long-term perspective for Amsterdam been so emphatically developed from the bottom-up, proceeding from a multitude of interests and drawing on contributions from every section and stratum of society. Thanks to an open approach and making full use of ‘the wisdom of crowds’, many people have contributed to the conception of a liveable, sustainable and thriving city, somthing which would have been unthinkable without such a breadth of input. The Structural Vision for Amsterdam took shape between 2008 and 2011, in the space of barely two years. Via a special website, binnen30minuten.nl (withing 30 minutes), which is indicative of the city’s radius of influence as well as its accessibility from the surrounding region within half an hour – everyone was welcome to contribute and share ideas and suggestions with regard to the city. The site generated more than 2.000 ideas and prompted hundreds of discussions. Almost 8.000 people visited the ‘Free State of Amsterdam’ exhibition in the Tolhuistuin, where for a period of six weeks in the autumn of 2009 the citizens could personally programme the future of the city. About 2.000 schoolchildren allowed their fantasy to run free as they imagined a better and more pleasant city, while some 200.000 people watched the documentary Amsterdam Makeover 2040 on Dutch national television. At the request of the neighbouring municipalities the Structural Vision integrated regional characteristics. When the vision was published, almost 800 citizens participated in a conference about the future of the metropolitan region. This hands-on development of a scenario for the future by the members of the metropolitan society was by no means incidental; it was a deliberate choice. It stemmed from the idea that spatial planning, even in Amsterdam, had ended up at a dead end and needed to be reinvented. What is planning? “Planning is what planners do.” Such a definition does not offer much of a foothold. “Planning is concerned with making decisions and informing actions in ways that are socially rational,” the American planner John Friedmann noted in 1987. Friedmann understood that the idea of planning is elusive. “There are many forms of planning and many specific applications.” He mentioned decision-making and action based on societal guidance as ingredients of a definition. But if planning has to be reinvented, then where should one begin? Planning is essentially about the way we relate to other people. We asked ourselves how we could activate people and encourage them to work together towards a common goal. That demanded shared meaning. Planning, we ascertained, is for at least 80 percent about communication. What planners do is nothing less than build on a civil society. In retrospect, that is also the lesson which can be drawn from the Amsterdam experiment: the more open the planning, the less the planners need to grasp for their instruments. In other words, the more human the planning. The less rigid it will be. Moreover, the great advantage of an open, interrational planning process is that it becomes more flexible and can adapt more easily to changing circumstances. In an environment of permanent, ever-increasing flux, adaptive planning is urgently required. Without flexibility and the ability to improvise, spatial planning will in the long run fade away. By making planning open and more communicative it can be saved, because without cohesion and societal cooperation there is no way forward. Proceeding from this starting point, in late 2004 the city of Amsterdam’s Urban Planning Department instigated an internal process that was intended to inject new life into the planning discipline. The deadlock into which Amsterdam’s planning machine had fallen tied in closely with the ossification of the department’s own methodologies. While the task of urban design profited massively from the boom of the 1990s and the judical-planning portfolio had been filled proportionally as a consequence of strong social opposition, the order book for the traditional research-focussed, policy-based work of the spatial planners shrank. At around the same time, Amsterdam’s City Council set about simplifying procedures in order to reduce process costs. The market had to be allowed greater leeway and whenever possible financial risks had to be shifted onto the shoulders of the developers. Slowness and viscosity in urban development were regarded as a problem, and from the municipal perspective the best way to deal with this was by leaving more to free-market forces. By doing this, or so people thought, it would also be possible to build more quickly and in greater volumes. Though complexity was mentioned as a reason, financial considerations and political objectives proved to be the principal factors. The administration had promised to build at least 20.000 new dwellings within four years. When it looked as if this would fall short of expectations, the planning had to become quicker, more efficient, cheaper and more rational. However, this bore little relation to what was actually going on: the rationality of the planning was already far too great; the planning had to become more communicative. The planners practiced implementing the new, communicative planning for two years. Their efforts were in the first place aimed at achieving results more quickly. An attempt was made to gain support for ideas through enticement and persuasion, rather than by presenting abstract data. Presentations had to be shorter and more attractive, and a new cartography was born. The goal was broadened: time gains aside, the planners wanted to inspire people, inducing them to share their thoughts, ro activate them. Towards the end of 2005, the idea of establishing platforms that would be open to everyone and which would permanently share insights with third parties was in the ascendant. These interfaces, or so it was thought, were meant to mediate between the world of scarce resources – the unruly practicalities – and that of future cohesion, i.e. a shared vision. The first platforms were established in the autumn of 2006: first Southwards, then Westwards, then Eastwards, followed a year later by the RADAR and ROER consultative bodies. In late 2005, midway through the ‘planning discussion’, a planning story for the future was concocted. The departure of a colleague from the provincial planning agency was seized upon to test the provisional fruits of the planning discussion externally. This also presented an opportunity to do something with a recent experience: discussions with political parties on the eve of the municipal elections had brought to light that Amsterdam’s politicians were lacking properly formulated spatial ambitions; there was no politically articulated perspective. The idea of the planners devising their own futuristic vision grew under the lee of the elections. It was based on all the ideas which had been generated over the course of the planning discussions and was aimed at stimulating ambition. The ‘Bestemming AMS/Destination AMS’ narrative was released in the midst of the election fever of early 2006. To the astonishment of many, there was a great deal of interest in this story about the future. People who heard it passed it on. Requests for presentatioans followed one after the other. The venues kept growing in size, from small conference rooms to gymnasiums, lecture halls, theatres, works canteens and eventually large conference centres. The planners told the ‘Destination AMS’ story more than 60 times. And the story itself kept growing, because at each presentation the audience provided new information and suggestions, and these were continually incorporated into the story. No presentation was the same and nothing was set in stone. Interestingly, the narrative tied in with a growing number of listeners’ personal stories. Instead of a plan being formulated in the offices of a municipal department of urban development agency, a vision for the future was gradually created to which many people had contributed. It seemed that the story was absorbing all the knowledge, experience and insights from different parts of society, and was giving them back to the city. It felt, in short, like Wikipedia: thousands of people working on one story, chapters growing not from harmonious thought but from constant scrutiny and emendation. As time went on, this connection between personal stories and the story about the future metropolis spawned new initiatives. Projects were launched that related to the story or referred to it, some of them even arising from it directly. The story not only inspired people, but prompted them to identify with it. More and more people became ‘collaborators’. In the spring of 2007, administrators from the neighbouring municipalities, roused by the narrative, decided to create a regional vision for the future in conjunction with Amsterdam and the provinces concerned. Everyone became involved, ideas were amassed. This informal approach meant it was possible to seek agreement and coordination at an early stage. This integral scenario was ready barely nine months later. It was launched at a regional congress. It was decided to use this joint story about the future, which was endorsed by 36 municipalities and two provinces, as the basis for all the structural visions that were yet to be formulated. The agreement was marked by changing the name of the erstwhile ‘North Wing of the Randstad’. During the congress on 14 December 2007, the assembled administrators renamed the ‘North Wing’ as the ‘Amsterdam Metropolitan Area’. The participants decided to intensify regional cooperation even further. Not long thereafter, Amsterdam’s City Executive made moves to produce a new vision for the city’s own territory on the basis of the regional vision. In the eyes of the mayor and aldermen, the 10th structural masterplan for the city would have to provide a framework for ‘a sustainable, attractive and accessible metropolis’ in 2040. The planning work proper could now begin. The achievements in the planning process described above are far from set in stone. It is not the hard edges of planning – money, the actual plans, procedures, instruments – that determine success, but the soft edges: the shaping of a vision, whipping up enthousiasm, getting people actively involved. Interestingly, within the City of Amsterdam’s planning as outlined above, the story takes the place of the design, and in this the story serves just as that: ‘an oral presentation of events, whether true or invented, told with the aim of entertaining and enthralling an audience.’ The narrative element actually plays a pivotal role. This raises the question of what it is that makes storytelling so successful. In psychology, five factors have been distinguished: these are receptivity, familiarity, trust, empathic witnessing, and recreating the self. I shall dwell briefly on each one in turn. The first factor is receptivity: as soon as people hear a story, they become receptive. That is because storytelling is usually associated with pleasure, relaxation, sociability, or even togetherness. This was certainly borne out by the responses at the meetings. The stories were always received with great enthousiasm, and this enthousiasm proved to be infectious. As for familiarity, stories tend to strike a chord among listeners because of their anecdotal quality – far more so than with maps or designs, which may be impenetrable for laymen. Stories tend to reflect the experiences of ordinary people directly. The third factor is trust or confidence. Stories provide an opportunity to feel a sense of confidence. People tend to feel more confident about the future when numerous recongnisable situations are placed in a wider context. That was one of the key qualities of the ‘Destination AMS’ story-based project. Various ongoing spatial developments were extrapolated into the future and placed within a single reassuring whole. The fourth point is that the audience is essentially listening to someone’s personal testimony. This personal testimony is far more likely to inspire trust and empathy than, say, a plan being presented by some official or administrator at a consultation evening for local residents. Finally, listening to stories creates opportunities for redefining the self. The audience is invited to identify with different roles and characters. As a result, stories tend to soften the us-and-them attitude that people naturally adopt when faced with an unknown future. Where planning is concerned, this is extremely important: stories are embedded in relatiomships with others. Because of this specific relational value, they can help to alter perceptions of a diversity of scenarios, making them seem more palatable or even making them look like interesting challenges. People lay themselves open to criticism and negotiation in a narrative process, and they are willing to modify their own convictions, so it is easier to reconcile a diversity of interests. Good stories are infectious and spatial planning exists by the grace of good storytelling. Although this narrative element is often overlooked in the planning literature, it seems crucial to its success. Narrative practices such as those employed in Amsterdam present opportunities to create a public space that incorporates a sense of solidarity and trust on the one hand, with respect and understanding for the need for different perspectives on the other. Good stories confront us with our moral responsibilities and encourage us to act collectively. They provide the best saveguards against ‘blueprint thinking’ and undue faith in a ‘makeable society’. But none of this potential can be realized unless stories are first incorporated into our planning procedures. The critical success factors were determined by experiment, proceeding from the experience gained in the aforementioned platforms. Until then a great deal of attention had been devoted to the set of instruments or toolkit, the organization and modus operandi. Behaviour and attitudes are, however, just as important. Nine practical rules were formulated, and these boiled down to the following: get down to work immediately and establish a platform; start small and exclude nobody; all forms of manipulation (whether power, money or competences) are forbidden; focus on the content and share stories; be succinct in presentations and listen attentively; rein in the emotions; remain curious and never give up. In Amsterdam stories have been jointly developed by many parties ever since, within the abovementioned platforms that explore the future of an area or sub-sector and place it on the agenda. These platforms are driven by content and have swiftly developed into consultative bodies where knowledge is continually shared, visions shaped and lessons drawn from real-life experiences. Everyone is welcome to participate. That does not alter the fact that there is constant attention to maintaining a healthy balance of power. Finance, instruments and legislation are emphatically consigned to the backround; they are subservient to communally formulated goals rather than leading, let alone being employed to limit the possibilities. This is how storytelling has been fruitfully integrated into Amsterdam’s planning practice over the last five years. In early 2008 a start was made with the preparations for the Structural Vision. An atlas was compiled to serve as an agenda for a great many discussions. Conditions and tasks from the so-called regional development scenario were employed as guidelines and appeared as such in the keys to the maps. The region-wide metropolitane ambition from the development scenario was adopted as the guiding principle. The majority of the discussions were conducted a year later, in March 2009, and many of these took place within Amsterdam’s bureaucratic apparatus, between municipal departments and with the city boroughs. The outcomes were translated into a quartet of spatial developments – these were in fact cast as narratives – which later became known as development directions or ‘thrusts’: a densely developed inner-city milieu that continues beyond the city’s orbital motorway, extending into the post-war city; a regional waterfront with dense, functionally mixed development along the river Zaan and IJ waterway all the way into the IJmeer lake; a curved Southern Flank between Schiphol airport and the Academic Medical Complex, with offices and stacked, high-rise living on either side of the bundles of infrastructure; and the integration of the metropole’s circumjacent man-made landscape with its polders, parks and meadows. These four thrusts were in part derived from the ‘planning discussion’, while to a certain degree they also seemed to derive from the ‘Destination AMS’ directly. As a story about the future, a dreamin the making, they did not prescribe anything in advance, but they did offer sufficient foothold to develop a new, grand narrative about Amsterdam’s development into a sustainable and liveable metropolis. It was now the moment to involve the whole of the city in the forward looking discussion. An interactive website was launched, so that citizens could make known their wishes with regard to their city. Via ‘binnen30minuten.nl’ they could also comment freely on each other’s ideas. Over the course of 2009, more than 2.000 ideas were collected in three consultative rounds. The devisers of the ten best ideas were also invited to meet the alderman for a face-to-face discussion. The campaign’s grand finale was a large-scale event in the autumn. In September 2009, at the end of the City Council’s four-year term in office, the planners presented the ‘Free State of Amsterdam’. This ambitious exhibition programme adressed the future of the Amsterdam Metropolitane Area. Colossal scale models were exhibited in the Tolhuistuin for a six-week period. The day after the opening, The New York Timescharacterized it as ‘Amsterdam’s latest buzz-worthy exhibition’. The ‘Free State’ called upon the city’s inhabitants and visitors to share their thoughts about the city. Nothing was predetermined and they could talk about the future in all openness. Even the nine scale models, most of which were realized at a scale of 1:1.000, refrained from establishing the future in fixed outcomes; the models were starting points for novel possibilities. They formed the core of the exhibition and were the response to a commission granted to nine urban planning bureaus based in Amsterdam and Rotterdam to devise future scenarios for specific sections of the city. These bureaus were asked to render the degrees of freedom in their proposals as broadly as possible and embody this in ‘living’ scale models. They were asked to reveal the potential outcomes of various spatial strategies to the public in a scale model. As few aspects as possible were predetermined. The idea was that engagement and individual responsibility are typical of the urban development of the 21st century, alongside freedom, changeability and the capacity to improvise. Building on a new civil society is the modern-day task of the planning discipline. The exhibition was accompanied by a programme of dialogues. On no fewer than 29 evenings, citizens could unfold their thoughts freely. All these discussion evenings were open to the public, but were deliberately assigned to interest groups and organizations to allow them to present their own programme, focussed on the future of the city, with their own special guests and a broad-based audience. The organizations and groups approached included political parties, the Chamber of Commerce, urban planning bureaus, homeless people, philosophers, expats, students, shopkeepers and secondary school pupils, and they all took up the invitation. This programme component took the form of storytelling. Gathered around the scale models, people could tell their own stories. The more personal the stories, the more exciting the people found them. Night after night, all these narratives, with their traces of rhetoric and persuasion, provided new knowledge, but also inspiration and mutual understanding. Thanks to the interchange of all those personal experiences, insights and desires, these evenings were visionary and practical in equal measure. A free supplement was distributed in a print run of 100.000 with Het Parool newspaper, to encourage the city’s citizens to visit the ‘Free State’ and actively participate in the programme. ‘Dreaming about the City’ was produced by the editorial staff of this Amsterdam-based daily newspaper. Almost 8.000 people responded to the call, including 2.000 schoolchildren who visited the exhibitiom in the context of ‘Looking at Art’ – a programme that offers professional guided tours of the city’s museums to Amsterdam’s primary schools. This programme was extended to include the Free State. It brought children aged between 10 and 12 years into contact with urban scale models for the first time, and they could observe how the city is conceived and deliberately designed. They effortlessly generated ideas for better cities. Openness was particularly evident at the exhibition space itself. The choice of venue did not fall on the municipal information centre for space, building and living. After months of hunting, the right location presented itself: the Tolhuistuin, or ‘Tolhuis garden’. Situated on the banks of the IJ waterway and directly opposite Central Station, there was a venue in a park which had been hermetically sealed to Amsterdam’s inhabitants since 1942, and a large space was available in the temporarily vacant, former company canteen. The site was eventually transferred to the city on 6 June 2009, just three months before the opening of the Free State. Offering a splendid view across to the historical city and the city in the process of renewing itself, we had happened upon the ideal setting for an exhibition of scale models which adressed the future of the metropolis. The opening was preceded by the transmission of the documentary, Amsterdam Makeover 2040 on Dutch television. Broadcast, the film was watched by more than 200.000 people that late evening. It placed Amsterdam’s spatial issues in a global, continental and national perspective. Produced in the context of thr International Architecture Biennale Rotterdam (iABR), which took the ‘Open City: Designing Coexistence’ as the theme for its 2009 edition, the documentary’s key theme was open versus closed cities within configurations of urbanized mega-regions. On the Friday prior to the opening, there was an exhibition preview for 300 schoolchildren from Amsterdam-North. A meal in the garden, prepared using ingredients cultivated within the region, was combined with an opportunity to see the scale models. On the day of the actual opening, a special train using the brand new Amsterdam-Paris high-speed rail link to carry the Rotterdam Biennale’s guests to the exhibition site on the far side of the IJ waterway. The German philosopher Peter Sloterdijk delivered the opening speech for an audience of more than 400 invited guests in the garden in the evening sun, under an old tree. A week after the opening, a two-day International Urban Planning Congress, entitled ‘Morgen/Tomorrow’, was staged at the Westergasfabriek for an audience of, again, some 400 guests. Key-note speakers were the former mayor of London, Ken Livingstone, and the representative of the Green Party delegation of the European Parliament, Daniel Cohn-Bendit. Under the rallying-cry of ‘Cities can save the world’, the conference offered a programme of lectures and workshops, in which the flows of water, enegry, waste, ICT, food and mobility were considered in their mutual interaction. Besides general presentations about Chicago, Pittsburgh, London, New York, Berlin, Moscow, Mumbai and Tirana, the outcome included a whole raft of examples of local practices of metabolism which can mitigate and positively influence global problems. All these events contributed to the narrative of Amsterdam’s Structural Vision, which was completed in December 2009. All the material from the website, the fruits of the Free State event and the congress were collated and aggregated by the city’s planners. Aggregation is the operative word here, because selection or compromise would have meant too many insights and visions being lost; it is the very multiplicity of ideas and stories that makes a shared vision diverse, rich, robust and convincing, and diversity does full justice to the big city’s complexity. Aggregion was also called for in order to honour the many different perspectives in a situation of uncertainty, a means of reducing the possibility of mistakes. After all, nobody is able to predict the future and there is nobody who can single-handedly manage the city’ development. In The Wisdom of Crowds (2004), James Surowiecky demonstrates how diversity, autonomy and decentralization are preconditions for propagating collective intelligence. Large groups of people will come up with better and more robust forecasts and make more intelligent decisions than even the most skilled decision-maker. Intelligence is formed by mixing expertise with other forms of knowledge. One-sided manipulation, such as ‘group think’, is fundamentally unacceptable. “The smartest groups, then, are made up of people with diverse perspectives who are able to stay independent of each other.” Moreover, the closer to a problem someone is, the more likely he or she is to have a good solution to it. “Decentralization’s great strength is that it encourages independence and specialization on the one hand while still allowing people to coordinate their activities and solve difficult problems on the other,” writes Surowiecky. It is also better to organize urban development from the bottom up. By developing the Structural Vision with the help of thousands of people, Amsterdam has managed to tap this collective intelligence. The four developmental thrusts provided the storylines in which the panoply of insights could be processed. Much attention was devoted to the text’s readability. The accompanying maps – wherever possible even richer and more detailed than usual – had to seduce first and foremost, but they also had to be legible and at the same time overwhelm the reader. The selected cut-outs were regional. They were angled slightly in order to depict all the neighboring municipalities and to position Zuidas, Amsterdam’s 21ste-century commercial and residential development, at the midpoint of the map, while the 19th-century defensive ring of the ‘Defence Line of Amsterdam – on the list of UNESCO World Heritage – was chosen as the boundary for the fleshed-out scenario, because it is situated at an ideal cycling distance from Amsterdam. Each of the narrative threads played out within this footprint. In the months that followed, City Council elections were held and political negotiations ensued to form a stable coalition for the governing City Executive. The elected councillors assumed their seats in early May 2010. After everyone had been briefed and shown the ropes, the City Executive could prepare for the final debate. Almost a year later, on 17 February 2011, the Structural Vision was unanimously adopted by the new City Council. To celebrate this, but also to emphasize that the task was far from complete, a major conference about the new Structural Vision, which had just rolled off the printing presses, was organized three months later. Everyone who had contributed over the preceding years was invited to participate: city-dwellers, experts, politicians, entrepreneurs. Almost 800 citizens took up the invitation. Plenary lectures were once again alternated with a diversity of workshops in which people were activated. Thanks to the diverse mix of participants, the atmosphere was libely, joyful and opeN, and the message resounded once again: it is not us, but you together who will decide the future of the city. The future is open, but no longer it is undecided. After all, there is now a shared vision. Building on a civil society is like Wikipedia. It will continue.